This article may be trivia to Americans, but beneficial to the rest of the World who are not familiar with the Imperial system. 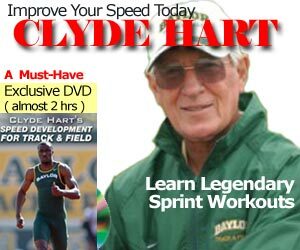 You’ve seen the classic workout of 2 x 352 yards in older sprint programs like Bud Winter and other great coaches. To use a very bad analogy, it’s similar to buying a “fifth” of a bottle of hard alcohol. It is exactly one-fifth (1/5) of a US Gallon or 25.6 ounces, 1.6 pints, 0.8 quarts or 0.75706 liters. The standard size today is 750ml or 0.75 Liters. Same with the 352 yard workout. It is exactly one-fifth of a Mile or 1760 yards. I always stick to 40 seconds as my golden rule for speed endurance workouts. Bud Winter’s workouts consisted of 3 x 352 yards in 44 sec with 15 minute recovery. You would drop 2 sec every month until you can do all 3 in 38 sec. That’s equivalent to 35.5 for 300m. My McGill days with Coach Dennis Barrett consisted of Wednesday’s workouts of 3 x 300m with 15 min recovery. I still remember them vividly. The first 2 reps were “easy”. I never looked forward to the 3rd one. According to AtoBolden.com, John Smith’s HSI group would do the 3 x 300m workout with only 8 minutes recovery, though his world class sprinters would do them in the 35’s range and therefore resembles more of an intensive tempo workout with their top end speed. According to Charlie Francis, whenever Ben Johnson had a 300m workout scheduled, he would always find a way to skip the workout. And usually he did. Jimson, would you stick to that 40 second rule for HS athletes or would you possibly make it longer? I would stick with 40 seconds, no matter what the age is. I use the principles in the Energy Systems. Bud Winter was one of the first coaches to document the 352 yard workout. His out-of-print book, “So you want to be a sprinter” lists 19 types of workouts for the sprinter. That book will be re-released in the next 30 days or so. Wasn’t the houston astrodome track 352 yards? I remember a formula for 400 meter success that said, 352 time + 10 seconds = 440 yard time. Does any one else remember this? I believe that Sam Bell used that at Indiana. Bud Winter’s book re-released? Awesome! Who is responsible and more importantly where will I be able to get it? It’s no secret I am the webmaster for the new Bud Winter site. @Rayne – I grew up in Canada and the metric system. It was only when I divided 1760 / 5 that I realized where 352 came from!